To conduct the study, the scientists searched the Sorenson database for Native American mtDNA and then sequenced the entire mtDNA genome of some of the samples. There is more coverage at Dienekesâ€™ Anthropology Blog and The Spittoon. SALT LAKE CITY and PAVIA, Italy (Jan. 8, 2009)â€”Genetic researchers from the Sorenson Molecular Genealogy Foundation (SMGF) in Salt Lake City working with scientists from the University of Pavia in Italy today published a study shedding new light on the puzzling question of why Native Americans exhibited such extraordinary linguistic and cultural diversity when the first Europeans arrived in 1492. By analyzing for the first time at the highest level of molecular resolution two rare lineages of the maternally inherited mitochondrial DNA (mtDNA) from modern Native Americans, geneticists identified separate migratory paths that marked the initial stages of human colonization. Traveling concurrently, one genetic group of Paleo-Indians followed the Pacific coastline route and arrived at the southern tip of South America, while the second group followed an ice-free corridor east of the Rocky Mountains and settled in the Great Plains and Great Lakes regions. 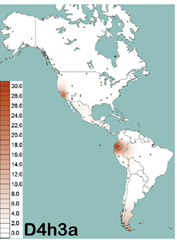 The evidence that separate groups of people with distinctive genetic roots entered the Americas independently at the same time strongly implies linguistic and cultural differences between them. â€œThe origin of the first Americans is very controversial to archaeologists and even more so to linguists,â€ said study corresponding author Professor Antonio Torroni, heading the University of Pavia group. â€œOur genetic study reveals a scenario in which more than one language family could have arrived in the Americas with the earliest Paleo-Indians.â€ Torroni is a world-renowned population geneticist in the field of mtDNA research and the first to identify the major genetic groups to which 95 percent of Native Americans belong. For both studies researchers combed the Sorenson databaseâ€”the worldâ€™s largest collection of correlated genetic genealogy information containing DNA collected in more than 170 countriesâ€”for mtDNA belonging to Native American lineages. Then, using techniques developed at the University of Pavia, the samples were analyzed using a complete-mtDNA genome approach for the first time. Todayâ€™s study analyzed two rare genetic groups. D4h3 spread into the Americas along the Pacific coast and, at the same time, X2a migrated inland through an ice-free corridor between the Cordilleran and the Laurentide glaciers. The D4h3 group is rare today in North America, while X2a is found exclusively in the U.S. and Canada, mainly in the Great Lakes and Great Plains regions. The six most common Native American mtDNA lineages are A2, B2, C1b, C1c, C1d and D1. The study, â€œDistinctive Paleo-Indian Migration Routes from Beringia Marked by Two Rare MtDNA Haplogroups,â€ was published online today by Current Biology and will be the cover story for the print version on Jan. 13, 2009. I’m Haplogroup X2a2. Nice to read about my maternal ancestor’s migration.